Like neurosurgeons Paul Kalanithi and Eben Alexander, who have both written about becoming patients after years of treating patients, Jan Fawcett, M.D., had his eyes opened when diagnosed with malignant melanoma after 30 years in medicine. The diagnosis gave Fawcett the opportunity to think about what he wanted from life and what he was currently getting. 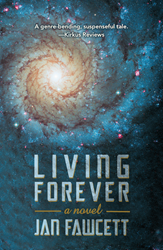 Living Forever, Fawcett’s first work of fiction, is a wake-up call to humanity that technological progress is not always a good thing. The science fiction novel calls for more focus on the creative brain than the rational brain and emphasizes mindfulness as a way to save humanity. For more information, visit http://janfawcett.com/. Jan Fawcett, M.D., is a professor of psychiatry at the University of New Mexico School of Medicine who has devoted his clinical and research career to treating severe mood disorders and trying to prevent suicide. For 30 years, he served as the Stanley Harris, Sr. Chairman of the Department of Psychiatry at Rush Medical College in Chicago. He has published more than 160 journal articles and 40 book chapters and received a number of awards for his research. He has also edited and written monthly editorials for teaching journal “Psychiatric Annals” for more than 20 years. Living Forever is his first novel.